Turnabout is fair play. The shoe’s on the other foot. Something about geese and ganders. When a player like Javier Baez takes exception to an opponent’s display of emotion on the field, one can’t help but think about such phrases. Also, hypocrisy. There is, of course, some history. On May 18, 2017—one day short of one year earlier—Baez touched Garrett for a grand slam at Wrigley Field, and did just a touch of home run pimping. … even took the time to consider his opponent’s reaction. Baez (and some of his teammates) pointed out after the game that Cubs celebrations are strictly intramural, and not in any way directed at the opposition. So how about Garrett, a guy also known to occasionally show some emotion on the mound? Even if the pitcher’s Lion Kinging was directed at Baez (which it was probably was), there’s plenty of gray area when it comes to Baez’s own roaring. At some point, when a player is simply howling into the wind, it becomes difficult to draw too many distinctions. Mostly, this seems like protracted frustration drawn quickly to the surface. At the time of the incident, Baez was 2-for-his-last-22, with nine strikeouts. The slugger has hit only .226 since April 26, watching his batting average fall from .310 to .265 in the process, with a meager .410 slugging percentage. He hasn’t drawn a walk since April 11. Suffice it to say that he’s in no mood for these types of shenanigans. None of that, however, is particularly relevant. Javier Baez has rightly become a prominent face in the Let Ballplayers Celebrate movement, which is predicated on playing with emotion. Even if some of his points about Saturday’s game have merit, the overall optics of a guy like that calling out a response like Garrett’s doesn’t do much to further the cause. In researching a project unrelated to baseball’s unwritten rules, I came across an item that was too good to not share. May 25, 1979: In the sixth inning of a game against the Reds, Dodgers second baseman Davey Lopes drilled a three-run homer. Trouble was, the Dodgers led by 12 runs at the time, and he swung at a 3-0 pitch to hit it. The blast gave Los Angeles a 17-2 lead. The last thing a pitcher wants to do with his team down by a wide margin late in the game is walk batters, which not only suggests unnecessary nibbling but extends a game that players want to end quickly. When a count gets to 3-0 … it’s a near-certainty that the ensuing pitch will be a fastball down the middle. The unwritten rulebook does not equivocate at this moment, prohibit­ing hitters in such situations not just from swinging hard, but from swing­ing at all. There’s also the factor of rubbing it in while running up the score. In the modern game, of course, such actions are no longer universally seen as an unequivocal sign of disrespect. Baseball is entertainment, the thinking goes, and nothing is more entertaining than a well-struck ball. The rule still exists, but more players than ever opt out of recognizing it. In 1979, however, such was not the case. Two innings after Lopes’ homer, Cincinnati reliever Dave Tomlin fed him four straight inside pitches. None of them connected, but after the fourth, Lopes, irate, threw his bat into the air and hollered toward the mound. It was enough to draw players from both dugouts, even as Lopes angrily stalked toward first base. No fight appeared forthcoming until Dodgers utilityman Derrel Thomas—a perpetual wild card when it came to baseball propriety—decided to take a swing at Cincinnati’s Rick Auerbach, spurring numerous scuffles. This, far more than Lopes’ action, spurred the Reds to action. Before the next day’s game, Cincinnati players decided to draw names of the Dodgers out of a hat, representing their assignments in the eventuality of another fight. Every slip of paper said the same thing: Derrel Thomas. If you throw as hard as Aroldis Chapman, you must expect that your opponents will, on occasion, get squirrely. Should a ball get away from you and fly toward somebody’s head, this matter becomes especially prevalent. Should it happen twice in an inning—watch out. Thursday, it happened twice to a single batter, Nate Schierholtz of the Cubs, and Chicago was not pleased. The pitches were obviously unintentional: The game was tied in the ninth inning, which is when closers pitch, which is why we so infrequently see closers carrying out any form of retaliation. The Cubs let Chapman know about it anyway, from the dugout at top volume. Things could have ended there, but for Chapman’s subsequent dismissal of the entire Chicago dugout—delivered with an insouciant wave of his glove toward their bench as he was leaving the field after recording the inning’s final out. It’s easy to ask what could have been done to avoid all this. 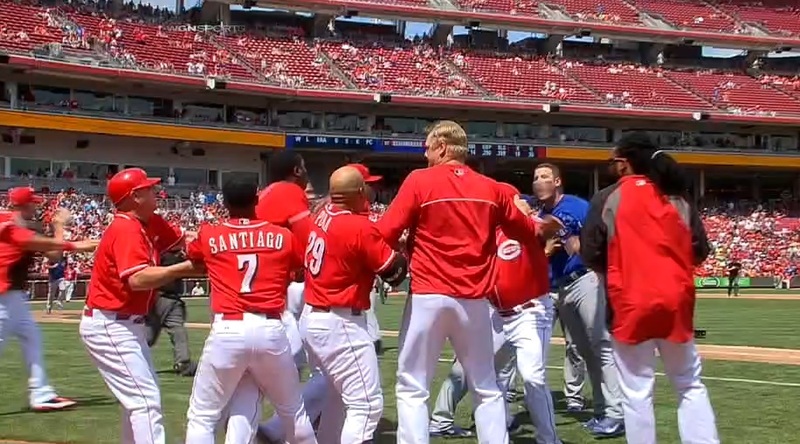 It’s yet unknown what Cincinnati players yelled at Rizzo, but a ballplayer has little business approaching the opposing bench like that. It’s unknown what Cubs players yelled at Chapman, but he has to be aware enough to realize that multiple top-speed, head-high pitches at the same batter are going to elicit a response. There’s something else at play here, as well: the disappearance of the quality bench jockey from the modern game. Once, players freely ragged each other from across the field in a back-and-forth patter designed to build unity on one side of the field and to get into players’ heads on the other. There were terrible aspects to the practice, such as what Jackie Robinson had to deal with on a fairly continual basis during the early part of his career, but there was also good to come from it. 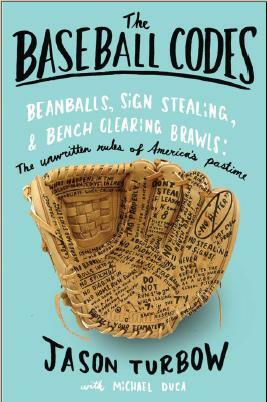 The patter between ballplayers took on a language of its own, and even as one side figured out just what to say to somebody in a given situation, players learned how to absorb the abuse without letting it get to them. The best bench jockeys performed verbal kung fu, turning the abusers’ words back on them with additional heft. Schoolboy Rowe, a newly married pitcher for the Tigers, made the mistake during the 1934 World Series of concluding a radio interview with a question for his wife: “How’m I doing, Edna?” The St. Louis Cardinals made sure that the phrase was heard continuously and at top volume through all seven games. The Washington Senators bench once rode Mickey Mantle so hard that he was distracted into thinking the fielder’s choice at second on a ball he hit was the inning’s third out, and didn’t even run to first to try to beat the double play. One of the most famous moments in baseball history, Babe Ruth’s called shot against the Cubs in the 1932 World Series, was a result of bench jockeying. According to Cubs second baseman Billy Herman, Ruth wasn’t pointing to center field but responding, after two quick strikes, to the verbally abusive Cubs bench that he wasn’t yet finished hitting. His motion, said Herman, was to quiet Chicago pitcher Charlie Root, not to indicate where he intended to hit the ball. Once last summer (Durocher) was abusing Murry Dickson, Cardinal pitcher, from the coaching box so violently that umpire Lee Ballanfant begged him to lay off. Baseball diamonds are a more genteel place now, in many ways for the better. Still, when something comes up like what came up in Cincinnati yesterday, the downside of the disappearing bench jockey becomes clear. Modern players simply have comparatively little idea about how to deal with this kind of adversity. Take the story of another Reds player, pitcher Mario Soto, who in 1982, rattled by heckling from Phillies third base coach Dave Bristol, walked six and gave up seven runs over 3.2 innings. He was so mad that after the game he called Philadelphia’s clubhouse and challenged Bristol to a fight. His manager, Russ Nixon, offered a different perspective. “That’s just something Mario is going to have to learn to deal with,” he said.